Tornagrain, located just off the A96 half way between historic Nairn and busy Inverness, boasts the perfect location – at the heart of a rural community but only a ten minute drive from the hub of city life. The designs of the houses hark back to local days of old, taking their design cues from the best of what has come before and incorporating the latest in building methods to create warm, comfortable and beautiful homes. Capturing the very essence of Tornagrain and coinciding with the first buyer moving into their Stephen property, the ‘Dunvegan’ is now welcoming its first visitors. With a light-filled, welcoming entrance hall, this property has been designed to suit any growing family, or couples looking for a little bit more space. 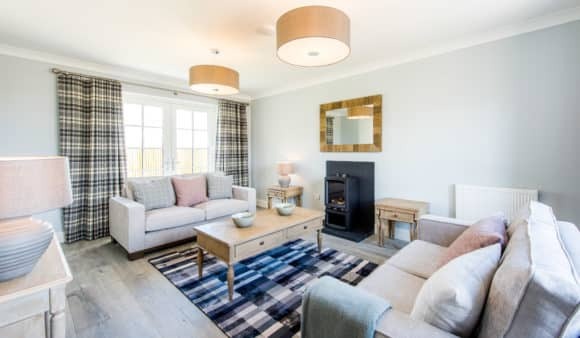 With an open-plan kitchen, dining and family room, these homes are centred around modern living, with a comfortable lounge and well-proportioned bedrooms with a master en-suite. There is also a large family bathroom with bath and separate shower cubicle. The ‘Dunvegan’ really is a home to enjoy, with its interiors giving a subtle nod to the rural location of Tornagrain, with light, natural tones throughout set against the very best in contemporary fixtures and fittings. Outside, the property won’t disappoint with an enclosed walled rear garden featuring a tranquil seating area in a sensitively landscaped layout. The sum of five years of work by Moray Estates and their team, Tornagrain will create 5,000 homes as well as parks, schools, shops and offices. The town is and will benefit from the planned dualling of the A96 in the near future. Plans are also underway to create a train station at Inverness airport which will further increase the excellent connectivity of the town. Stephen will be building a selection of one and two bedroom apartments and two, three and four bedroom terraced, semi-detached and detached homes. The showhome is now open from 11am until 5pm, Thursday to Monday.